Alfio Basile has added Hugo Ibarra, Sebastian Battaglia and German Denis to his previously named squad for the upcoming 2010 World Cup Qualifiers against Bolivia and Colombia. 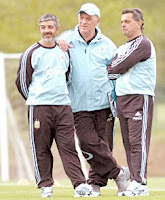 In a surprise move, Basile has done River Plate coach Daniel Passarella a massive favour, by not calling up Juan Carrizo or Fernando Belluschi to the squad. This leaves them free to play for River in Wednesday's Copa Sudamericana semi-final against Arsenal de Sarandi.